We are about six months into this whole travel blogging thing. During this time, we have recapped most of our previous travel. We’ve also documented most of the trips we have been fortunate enough to go on since we launched. It has been quite a journey already, and we are incredibly thankful for all of you who choose to follow along! As we grow and continue blogging our way across the world, we want to share more than just guides about the places we visit. We want to provide helpful resources and travel tips as well as share about products we love. But most of all, we want to explain to our readers WHY and HOW to travel. It is important to us that we are totally transparent with our readers about how we’ve been able to see a lot of awesome places around the world. And even more than that, we want to empower our followers and provide them with tools to do the same! I’ll start by saying that, yes, we are very blessed. On our About Us page we state, right up front, that we are another pair of privileged travel bloggers. It’s true. We grew up in stable, loving families (s/o to Mom and Dad) in America where food, clothing, and shelter were always available. But while you may think that we fund our trips with a credit card with my father-in-law’s name on it or with massive trust funds, we don’t. We have learned to be really strategic (that word is a theme throughout this post and our lives, lol). I work as a global supply manager at a large tech company in the Bay Area. Ruth is in tech recruiting. We have great jobs that allow us to not only survive in the high-cost-of-living Bay Area but also to responsibly save. Travel is something that we have talked about from day one of our relationship (over a $6 bottle of pinot grigio and Trader Joe’s pizza on the kitchen floor of Ruth’s college house, to be exact). We talked about making travel a habit and hobby. 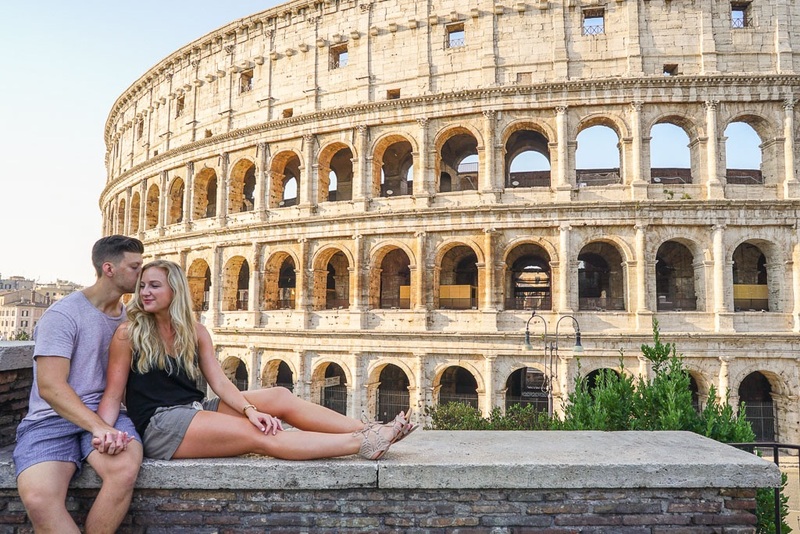 Since our first big trip together on our honeymoon in Italy, travel has been just that: both a passion and a priority of ours. Over a year ago when we started to brainstorm about creating Rome by the Hour, we made a decision. We decided that we would invest in travel, for ourselves and for our marriage, but even moreso for the blog. We loved the idea of documenting it all and providing a resource to inspire and equip others to do the same! Because I have **somewhat** of an intense personality (I can already hear my friends snickering), I take finances, business, and investments really seriously. I want the most value for my money, and I also want to be a responsible steward of what I have. So, no, we don’t have trust funds to pull from, and we aren’t frivolously blowing our income. We do, however, take advantage of every opportunity to save money while we explore the world. We try to be calculating and intentional about where, how, and when we do these trips. Put simply, the best advice I can give to someone who is wondering where to start is to be resourceful and (again) strategic. Let me be clear: this does NOT mean to not do your work, steal time, or fake it. This means BE STRATEGIC (like I said). This advice will mean different things to different people, but what’s important is that you are thinking about how you can use your job to your travel advantage. For me, I travel quite often for work and mostly internationally. This obviously provides a huge benefit in flight mileage accrual and credit card points. I get flight miles for each trip I go on, and that has allowed Ruth and me to redeem reward flights for most of our trips. I also get reimbursed for my expenses, so I can rack up additional points on my credit card to redeem for more travel (see next point!). That one is fairly obvious. But the next step is leveraging my actual work trips. Ruth has joined me on a couple of these trips (here and here). We pay for her flights with reward miles and then tag on a weekend or two to my trip. This means we can travel abroad together while only having to pay (but again, with points!) for one flight. It’s 2017 and a good time to be alive, people! In order to make this happen, Ruth has worked remotely during these trips. You may think that you will never have that kind of flexibility in your role, but you can start with asking! Ask your boss for a trial period of remote work so you can build trust. If you do get that opportunity, make it count by crushing it at work so you can leverage remote work in the future (à la Tim Ferris’ 4-Hour Work Week). Working from Europe isn’t as complicated as it sounds. On our last trip, Ruth worked an east coast workday which ended up being from 2pm to 10pm in France and Germany. This turned out well because I was working crazy hours during the week, and she was able to explore in the mornings before she started her workday. Take advantage of travel credit cards. There is simply no excuse here. Travel credit cards are really all they are cracked up to be. Go get yourself a good one (like the Chase Reserve, duh), and you will be on your way. We have a total of three travel credit cards between the two of us, and they have paid for a significant portion of our hotel nights over the past year. Most of the top travel credit cards have great sign-on bonuses (Chase does 50,000 now). It’s basically like a trust fund, right? To give you a point of reference of how awesome this is, we paid for eight (8) (EIGHT!) nights of our road trip through Central Europe last year with 100,000 Chase points. And if you are worried about the credit implications of opening a new credit card, don’t be! Adding new lines of credit will help your credit score, and it will also increase your total credit line which is a key factor in your credit score. Of course, I’m not a financial advisor. Talk to someone smart before buying a boat on a new credit card. Please, please don’t buy a boat. I’ve seen a lot of people complain that they are not able to travel and then turn around and blow a grand or two on a weekend at Coachella, Stagecoach, what’s that one in Chicago called, etc. If you want to do a Summer 2018 Euro Extravaganza, maybe don’t also commit to Labor Day 2017 in Vegas? This is fairly simple, but it’s a good example of what I am talking about: Ruth and I decided that we would forego any concerts this summer in order to save money for traveling. Start saving for your trip by making simple, concrete sacrifices like that. You will be surprised at how quickly those savings add up if you stick to it! If your limited sum of vacation days is acting as a roadblock, try to use your company holidays to make those PTO days stretch even further. Turn Memorial Day weekend into a 4-5 day trip by taking advantage of the holiday on Monday and taking a day or two off before or after. We did this when we went to Zihuatanejo this past spring. We only took two days of PTO and lounged on a beach for five days! Or use the winter holidays and general slowdown in most offices to make your escape. We went to Europe over the Thanksgiving holiday last November for two weeks. Going on vacation over a period where most of your team is already off or at least somewhat shutting down is a great way to maximize your exploring time. Go with a group and split lodging. One of the easiest ways to save money on travel is by splitting a rental with a small group of people. Get your closest friends excited about spending a week in Tuscany, and book a apartment or house through Airbnb. (follow this link to get $40 off!). Even if your friends are somehow displaying an aversion to vino and pasta and decide to not join, you can easily find a rental with Airbnb that falls within your price range. Staying in an apartment will give you a cultural experience that you’ll certainly miss in a hotel, anyway. If travel is important to you, make it a priority! Maybe you don’t have a job that pays you to travel or offers remote work options. If this is the case and you want to make travel a bigger part of your life than your one week of PTO per year affords, I offer some simple advice: do something about it! We live in an incredible time in history where you have the ability to truly pursue what you want. Boy, do I sound like a millennial. But seriously, if you are not happy about where you are right now, take action. That’s so funny, my husband is in supply chain too and I haven’t heard of that many other people who are in it! I am done with grad school in may and then our priority is traveling, like you two! Thanks for the tips! Such financial wisdom at such a young age to do what you desire. You are to be admired! God speed. ?